Have we gone too far?!? @Dephenistrator, and who invented flight? Electricity? Probably most importantly for the subject...who invented the dress? People need to get over all this petty bs and focus their attention on more important things. and i end on that note...because no matter what people will find something to make an agenda out of. This is a beautiful dress! I’d wear the heck out of this dress. @Kamitha, oh really??? But would you support the culture as well? @megamanx181x, I’m slowly starting to work my way through some pretty awesome anime. I’ve seen a few but some friends are pointing me towards a selection of excellent shows! @Kamitha, Hulu has a promotion going on to get their top subscription with Spotify for 99 cents for three months. After that you pay 15 bucks for both subscriptions, Hulu has a very big anime category. @megamanx181x, I can’t help myself but you have to watch My Hero Academia, oh my god so good!! Seriously mega man ! @DrSin, today's episode solidified it as arguably in the top 10 best of all time. Like the first two seasons I said "this is a really a good anime" the third season so far "this is a great fvckin anime" today while balling my eyes out "I love everything about this anime and I wish to dedicate my life to it"
@Kamitha, i would highly recommend both One Punch Man and Mobpsycho100. Megumin is adorable (the profile picture). 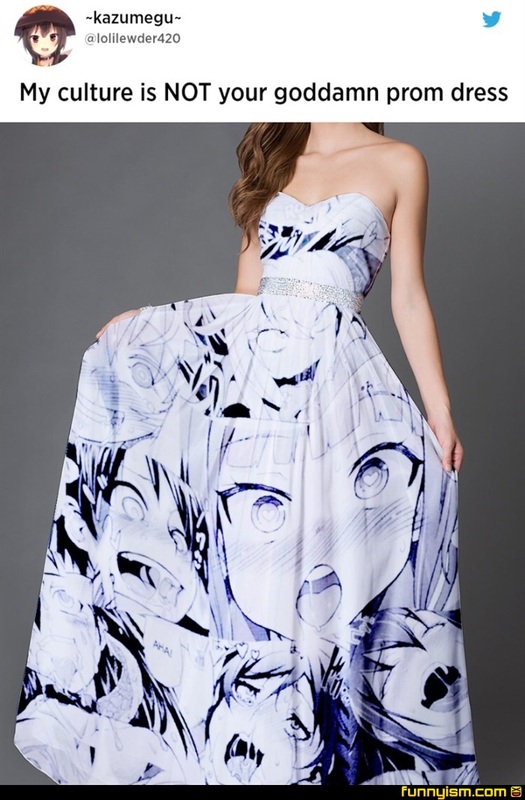 Sure, she gets a dress with faces on it and it's "cute." When I make a jacket with faces I'm suddenly, "creepy" and a, "serial killer." I'm just into fashion damnit!